Date: 23/07/10. Still recovering from Inception. I watched 42nd Street probably two years ago, and it has been gathering dust in my DVD collection ever since. I got it during my obsession with older films. But this film seems different the second time 'round, probably because I wasn't great at watching movies in my younger days...or rating them. A young woman trying to become an actress, Peggy Sawyer (Ruby Keeler), auditions to be a chorus girl in a major travelling production. She gets into the show, and is introduced to a world of exhaustion and rehearsals that never seem to end. Meanwhile, the shows star, Dorothy Brock (Bebe Daniels) breaks her ankle the night before the show starts, and Sawyer gets forced into the lead role. But can she do it on such short notice. 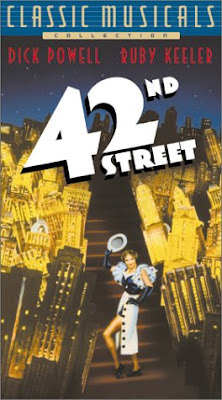 I still dearly love 42nd Street, but I must admit, I could see a lot of flaws in this film. It's not your typical run-of-the-mill musical which came out during the depths of the Depression to cheer everyone up, which is a good thing. But the films best asset: the amazing dance numbers choreographed by Busby Berkeley, are also one of it's biggest problems. Those are the highlights, and the rest of the film falls quite flat. Also, if you were actually watching the stage show, those dances would have sucked because you wouldn't have been able to see the formations going on...they required a birds eye view shot to see it. However, it entertainingly squanders through it's short running time with a stand out performance from Ginger Rogers. It is a great example of how much better musicals were back in those days, compared to now. A nice musical, albeit flawed, but charmingly entertaining.